Not everyone spits out sputum, there are spitters who enjoy disposing their gum on the sidewalk. Every stepped onto a fresh wad? The kind that literally makes stop you in your tracks? And then it dries up and leaves sidewalks with a sort of unwieldy polka dot pattern. Gum Buster to the rescue! 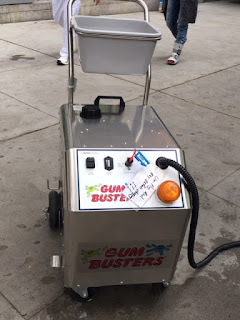 There is an actual machine that gets rid of old gum. The gum’s gone but what remains is a flattened, unwieldy polka dot pattern. And it’s not pretty either. Save your gum wrappers, they’ll really come in handy when the flavor’s gone from your gum treat but your civility is still intact.